Ah…the horsey signs of spring-shedding blades, spring storms and green, green grass. We are fortunate to have pasture for turn out. In the winter we are able to simply let Sophie roam the pasture and graze at leisure. We watch her run, play and eat all day. She comes in each evening for a bit of grain & her supplements and goes right back out to the pasture. It seems natural. And then…suddenly – It’s Spring. The pasture grass turns lush & green almost overnight-and quickly can become hazardous to a horse. Founder, weight gain & laminitis loom. One of our early solutions was shutting her in a dry lot. However this is “dry-lot” is often a mud -lot in the spring, plus… she receives no exercise locked into a restricted space. 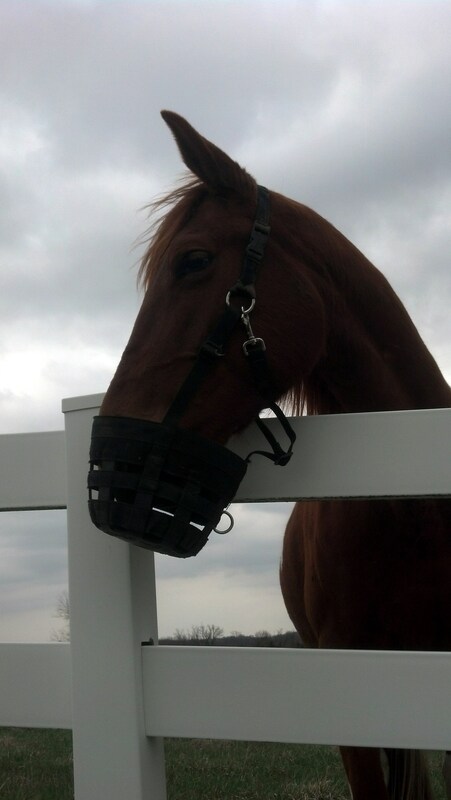 A solution that has worked well for me is a Grazing Muzzle. Our favorite brand is Best Friend Equine. It has a little hole at the bottom to limit the grass intake. With this “tool”, she can roam around the pasture all day. Run, Play, Roll & eat – a little. It’s great. 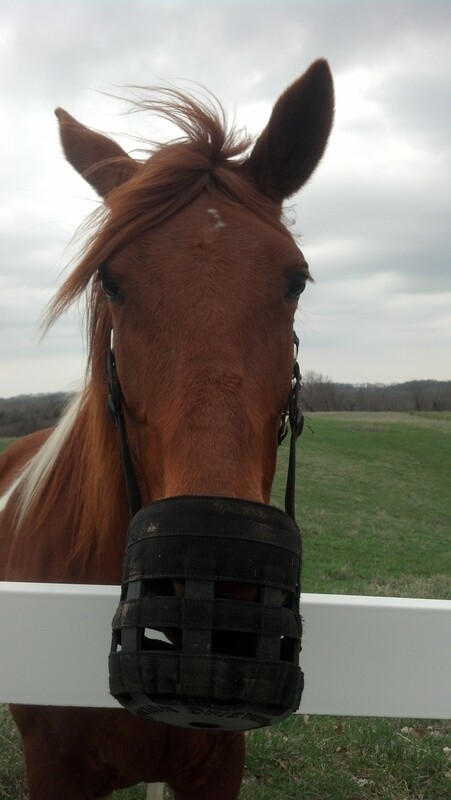 However there is “Adjustment Day” the first day of each Spring when she first adorns her seasonal Grazing Muzzle. We feed a treat through the hole when putting the Grazing Muzzle on, so she thinks initially that little hole at the bottom is a “treat-delivery-device”. Then the pasture gate is opened. She bursts out of the gate. Drops & rolls – scratching to combat the itchy long winter coat & attempting to loose the Grazing Muzzle. And then…she begins to graze. Not getting a full bite of lush grass can be frustrating to a girl. So she paws, eats, paws and then finally just eats. 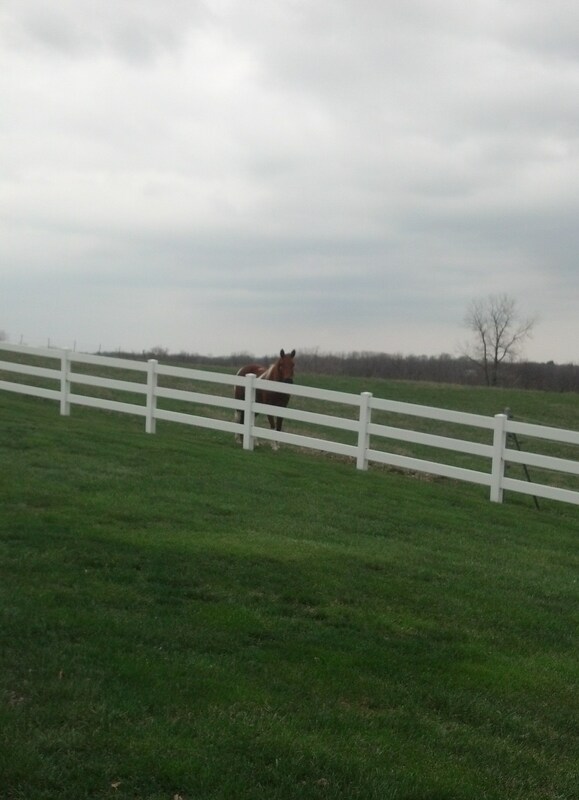 Each time she see us outside, she hurries to the fence to show us up close her predicament. She knickers, to be sure we have seen her situation. She pokes her head over the fence – just in case we would like to take it off… All a part of the spring ritual for Sophie & I. However I know after years of experience, it is for her own well-being. Its tough being a horsey Mom sometimes.